AFBDF was formally launched as an American non-profit to support the efforts of the Bethlehem Development Foundation (BDF), a non-profit organization headquartered in Bethlehem and founded by the late Said Khoury, with a Board of Trustees now chaired by his son, Samer Khoury. BDF’s mission is to create a sustainable economy and infrastructure for Bethlehem, and to enable the Holy City to sparkle as a peaceful beacon and unique spiritual center of the world for pilgrims of all faiths. The development of Bethlehem is essential in reviving the birthplace of Jesus Christ and in making this Holy Region a top travel destination, where pilgrims and tourists alike spend quality time, rather than merely passing through. Moreover, AFBDF aims to educate the American public about the religious, historical, and cultural significance of the city of Bethlehem, and focus efforts on the restoration of the Church of the Nativity. To visitors from around the world, whether they come as pilgrims, students, scholars dedicated to interreligious research or as tourists of secular persuasion, the City of Bethlehem can be the epicenter for the practice, experience, accumulation and dispersion of peace. For all residents, BDF & AFBDF aim to create a sustainable economic and social environment to foster the growth of a fully integrated, prosperous and harmonious community. 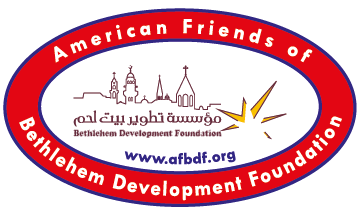 American Friends of Bethlehem Development Foundation has been truly touched and inspired by the outpouring of support from Americans of all faiths who wish to join our efforts to restore Bethlehem and honor this beautiful city.